Most folks say, "Mother Nature controls the rain". However this is not the case in the village of Finkleton. In the perfect little village of Finkleton, the weather is always perfect. Every farm grows the best, biggest, healthiest crops in the entire world, and everyone is happy. Soon after the Finkles inherit their Uncle Harry's shop and move to Finkleton, they discover magical secrets hidden in his shop. One clue at a time, Jack, Lizzy and Robert learn the town's amazing secret. No, Mother Nature is not in charge in Finkleton! Ever since Uncle Harry's death, the weather has not been cooperating. Farms are starting to fail. Will the Finkle children be able to solve all the magical mysteries before the village is destroyed? Come along to Finkleton. A very special, magical adventure is about to begin! Age Range 9-12 Childrens / Pre-Teen Fiction ********** Children's Literary Classics Seal of Approval June 8, 2011 ***** Literary Classics Finalist September 29, 2011 ***** Literary Classics Gold Award for Best of Pre-Teen Fiction October 14, 2011 ***** Reader Views 2011 Global Winner Europe - March 7, 2012 ********* READ THE SEQUEL - RETURN TO FINKLETON (SPRING 2012) Reviewed by Rita V for Readers Favorite Five Stars! Captivating! 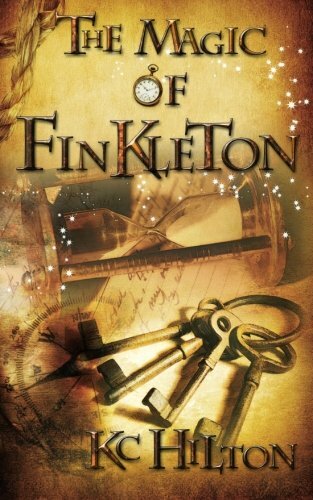 The Magic of Finkleton is a captivating novel. K.C. Hilton brings a powerful punch of magic into a fast-paced older children's book that does not disappoint. I found it to be inquisitive, exciting, and truly fun to read. It is rare to find a book so intricately written in which the reader is actually encouraged to participate. I loved the use of descriptive words; the plot was full of twists and turns, and the depth of the characters was amazingly accomplished. K.C. creates the perfect recipe of magic, adventure and imagination that are all easy to comprehend for older children on up to adult readers. I very much look forward to reading her next novel, Return to Finkleton. I can easily see K.C Hilton's series as either a television series or a film series comparable to Harry Potter, and I do not say that lightly. She is truly a genius in her mad writing skills, and this book portrays to all audiences who love a little magic in their life. This is by far, the best novel I have read all year, and if I could have given it ten stars, I would have. Look out world, here comes K.C. Hilton! When the Finkles’ house burns down and their Uncle Harry dies, it seems fat is driving them to move to Finkleton. Ever since their Uncle’s death, however, weather has been acting abnormally weird for Finkleton. The three siblings, Jack, Robert, and Lizzy, discover that Finkleton has an some kind of magical control over their weather and their uncle’s hourglasses and levers inside the store somehow control it. If the trio don’t figure out how to control the weather, Mr. Lowsley, a mysterious guy who seems to want power, is going to weasel his way into Finkleton. Can the Finkle children figure out a way to fix the weather before it’s too late? The character dialogues feel forced, but the character are fairly likable and engaging. The plot is a little slow, but the mystery is engaging. Readers who enjoy fantasy, adventure, mystery, and magic will enjoying reading this book. Returned me to the magic of childhood! This book, though written for children, can encompass all ages in the way of fairy tales of yore. A magical time when things are not what they seem. Well-written to keep anticipation coming, and flows with mystery and curiosity. An old shopkeeper dies and the village farms of Finkleton are instantly inundated with rain. At the same time a home in another village is struck by lightning and burned. What is happening with the weather? The home that was destroyed happened to belong to the heir to the old shopkeeper's store and property, and therein lies this delicious story. The displaced family of five arrive in Finkleton and very soon the youngest child makes a mysterious discovery. He keeps it secret but before long his sister, who reads everything readable, learns the secret. But when the weather gets out of control, they must let their older brother know what is happening. Should they tell their parents what they have found? Are there more secrets hidden in the old shop? Is Mother Nature really in charge of the weather? KC Hilton creates an entire world, not on a different planet, not even in an enchanted forest. No, this is a village surrounded by farms, some very famous and lush farms, in fact the most productive farms and best-tasting produce in the world. But even in such a perfect location, danger can rear its ugly head. I was charmed by this magical adventure and I can tell the next will be exciting, too. Their house burning down left few choices for the Finkle family. Taking over their recently deceased Uncle Harry’s general store in Finkleton was their only option. Arriving in the small England village after hearing father’s stories of Uncle Harry and his store, each of the three children were intrigued just enough to be looking forward to exploring everything. After a modicum of unpacking, they all wanted to look at the store and the house, Jack was the oldest and was looking forward to learning more of the workings of the store and finding the office in disarray, organizing was his first priority. The middle child and only girl was an avid reader and since the fire had consumed her store of books, she was only interested in the promised room of books. Once there, she quickly figured out how they were organized and selected her first nights reading material with the promise to return for them all at some point. As the youngest, Richard was trying to find his own place when he found something much more interesting. The lever under the counter seemed to control the rain. Astonished at his find, Richard wanted this to be his secret from everyone, but as the consequences started making themselves clear, her realized he needed hop to make sure Mr. Bad Guy never found out the true secrets of the success of Finkleton. - **** - What an adorable story. Some of the dialogue and wording felt a bit awkward at times, but I was hooked from the start and simply enjoyed it all the way to the end. While it was set approximately 100 or so years ago, this is one of those timeless fantasies. Simply adored all the children even with their sibling rivalry and teasing. This would be a fun book to read with younger kids (5-8) or to let older kids (8 and up) read on their own. It makes for a wonderful story, creative with some great characters, truly a story for all ages. After their house is mysteriously burnt, the Finkles learn that their Uncle Harry had died the exact same night, and he left all his belongings to them, including his general store. The Finkles pack up what didn’t burn in the fire and move to Finkleton to start a new life. The three children are Jack, Lizzy, and Robert, who are all uniquely different from another. Jack is the oldest and thinks he is the brightest. He enjoys numbers and organizing things. Lizzy is the bookworm of the family, and Robert is the youngest. The family moves into the apartment above of the general store. Lizzy is sad that all of her books were burnt in the fire, but instantly became happy when her father told her that Uncle Harry had a library in a secret room in the store. Most of the books are non-fiction, and Lizzy wants to read them all. Robert investigates the store and finds a strange room filled with hourglasses that are labeled and has a string attached to each of them, but one of the strings was broken. The family reopens the store, with a few customers complaining about all the rain because Finkleton use to have the perfect weather for farming. A stranger named Mr. Lowsley shows up several times asking about land he could buy. Robert doesn’t like this man, and believes that he is up to no good. Then, Robert pulls on a wood lever hidden in the store and the rain suddenly stops. Did Uncle Harry control the weather in Finkleton? Why does Mr. Lowsly want to buy land in Finkleton? When I received this book in the mail, my first thought was “This is a dazzling cover.” After reading the page and a half prologue, I was hooked into the world of Finkleton. It was a nice change to read an original book that doesn’t involve vampires and werewolves. I got a kick out of the kids bickering back and forth in the beginning of the book and enjoyed it when they started to work together to solve the mystery of Uncle Harry’s store. The Magic of Finkleton is a great read for both children and adults!